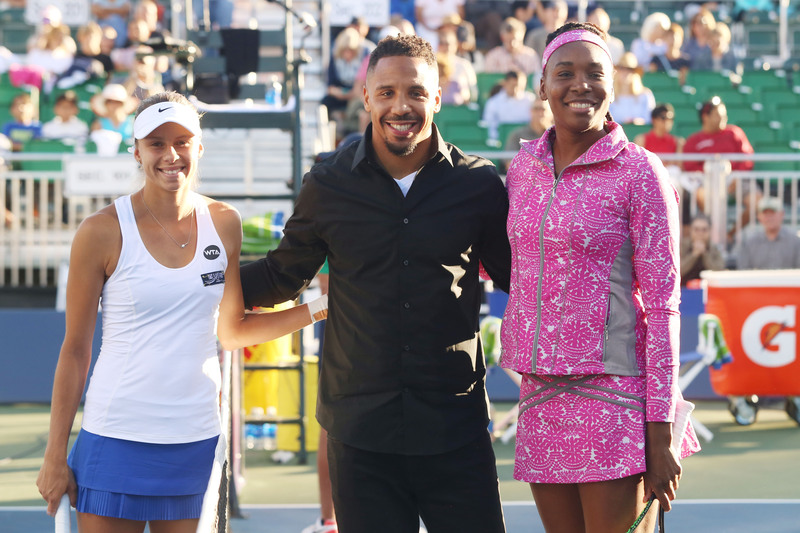 Last night, Two-Time World Boxing Champion Andre Ward took center court at The Bank of the West Classic at Stanford University to conduct the official coin toss for Venus Williams vs. Magda Linette, which saw Williams victorious in 3 sets. Ward calls the toss a “first” in his illustrious career. Prior to the match, Ward also connected with Wimbledon Champion Serena Williams, who was on hand to watch her sister’s match. Ward and Williams share a strength performance coach, Mackie Shilstone, as well as the honor of both being Olympic gold medalists. Andre Ward during the coin toss during the Bank of the West Classic in Stanford, CA. A proud Bay Area native, the undefeated Ward (29-0, 15 KOs) will return to the ring on Saturday, August 6 at Oracle Arena to continue his conquest of the light heavyweight division when he takes on Alexander Brand (25-1, 19 KOs). The event will be televised live on HBO World Championship Boxing® beginning at 10:45 p.m. ET/PT. Follow the conversation using #WardBrand. Tickets priced at $250, $120, $90, $40 and $30, not including applicable service charges and taxes, go on sale Tuesday, June 28 at 5:00 p.m. PT and will be available at all Ticketmaster locations, online at Ticketmaster.com and charge by phone at (800) 745-3000.